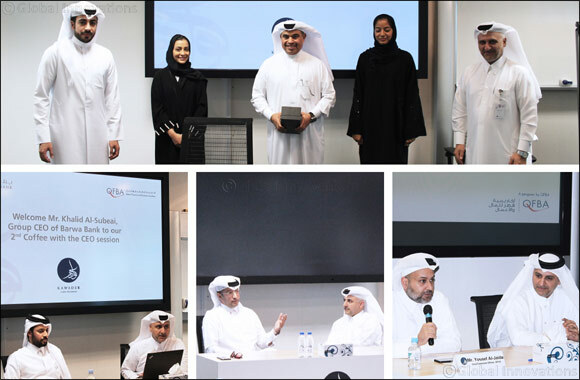 DOHA, Qatar – 15 November 2018 - Qatar Finance and Business Academy (QFBA), as part of its corporate connect endeavor, takes pleasure in announcing that it has successfully completed “Coffee with CEOs” series, for the 2018 Cohort of its quality qatarization program, Kawader. The event series was intended to engage leadership figures in the financial services sector in Qatar with young motivated Qataris who are currently working in the financial sector or aiming to do so in a casual setting where the CEOs share professional insights and industry wisdom. The Kawader program was kicked off on September 2 and will be continued till November end. Through this series, the undeterred efforts of QFBA paid off well towards shaping the future of new age finance professionals and offered them a way ahead to achieve success in their future endeavors. The influential list of CEOs included H.E. Ali Ahmed Al Kuwari, Minister of Economy and Trade for the state of Qatar & Group Chief Executive Officer, Qatar National Bank (QNB) at the time of his visit, Yousuf Al-Jaida, Chief Executive Officer and Board Member, Qatar Financial Centre Khalid Al Subeai, Group Chief Executive Officer, Barwa Bank; and Mr. Fahad Abdullah Al Khalifa, GCEO of al Khaliji Bank. These esteemed leaders are inspirational figures and have been transforming the Qatar financial landscape over the years. These powerful personalities shared their invaluable life and career lessons, providing the Kawader participants with unparalleled inspiration and guidance on their ambitious path. They also enlightened students on their success mantra, which they imbibe to lead the growth trajectory and leave a trail. Kawader is an innovative learning initiative that is specially designed for grooming high potential young Qataris towards the financial services industry. It aims to equip talented fresh graduates and young professionals, with practical skills and competencies required in the Qatari financial services sector. Kawader program includes financial Services relevant training based on global standards, which come as a result of the financial industry efforts to invest in the next generation of leaders in the Qatari Financial Sector. The program is designed to train fresh Qatari graduates and young Qatari professionals in the early stage of their career towards accredited certifications to fast track their career progression and fuel their leadership development. Via its simulation and work experience modules, Kawader focuses on practical aspects along with imparting theoretical knowledge. It also focuses on evolving market demands, thus providing the Qatari Financial Services sector with qualified individuals that have the necessary skills to actively contribute to the growth of economic development in Qatar.